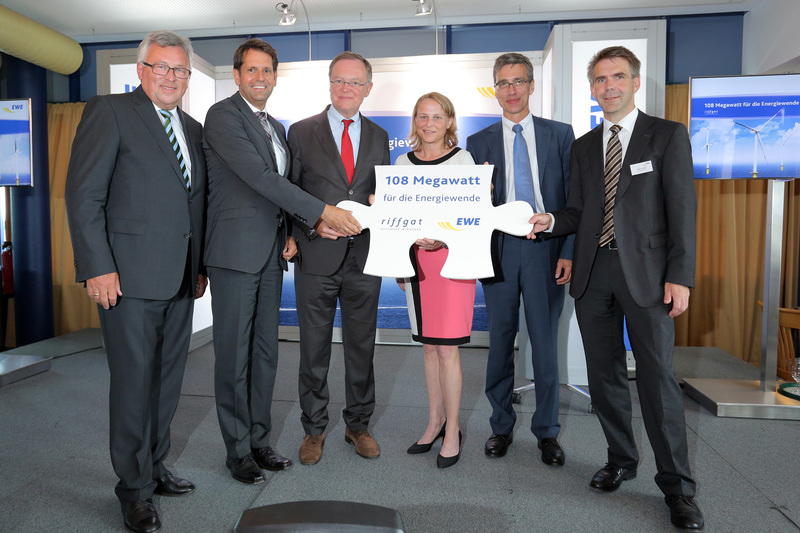 EWE AG from Oldenburg, Germany, celebrated the completion of the offshore wind farm Riffgat on 10 August. Riffgat is Germany's first commercial North Sea wind farm. However, it is not producing electricity yet because the wind turbines are ready but the grid connection is not. The utility company EWE installed a total of 30 wind turbines in only 14 months of construction for Riffgat off the coast of Borkum. However, the grid connection was not finished in time. Some 15 km of cable are missing, which the grid operator TenneT is expected to be able to lay in February 2014. According to TenneT, the cable laying operation is being delayed because there have been unforeseen problems during the recovery of old munitions from the seabed. "We are very disappointed by this delay - in our opinion, it could have been avoided," said Werner Brinker, Chairman of the Board of EWE AG. It is detrimental for wind turbines at sea not to be in operation, so EWE temporarily equipped the turbines with diesel generators. This allows the mechanical components to be in motion so that they do not get rusty in the aggressive sea air. Instead of generating electricity, the wind turbines and the substation are consuming electricity for cooling as well. The generators are burning through 22,000 L of diesel every month, according to energy supplier EWE from Oldenburg. Construction was literally a big task: Each of the 30 wind turbines has a capacity of 3.6 MW and a rotor diameter of 120 m. The hub height is 90 m, which corresponds to the height of the Bremen Cathedral; the overall height of the turbines is 150 meters from the water surface to the upper rotor blade tip. The colossal SWT-3.6-120 turbines from Siemens were transported from Denmark to their destination and anchored in 18 to 23 m water depth, and new sound protection measures were used to protect marine mammals.